Highly experienced AlphaCam CAD/CAM programmers and CNC operators provide the full range of work-to-file/disk/print/sample capabilities and the precision cutting and detailing of a wide range of composite materials on vacuum-bed CNC routing equipment. This allows all Gillfab®, Gilliner® and Gillfloor® panels to be supplied cut-to-size, profiled, drilled and detailed so they are ready for use. Panel edge and core fillings. Potted or mechanically fitted inserts and ferrules. Bolt/rivet-on hardware, aluminum details and self-adhesive elastomers. Non-slip paint, vinyl covering or other decorative finishes. BAE-appointed sole supplier of 748/ATP, 146/RJ and Jetstream 31/32/41 floor panels. The full range of Gillfab® and Gilliner® floor panels and cargo liner materials is available through The Gill Corporation Europe Ltd. 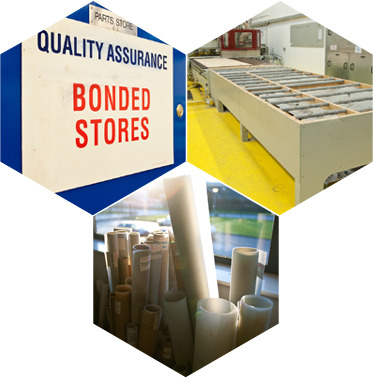 The most commonly used and popular materials are stocked in Northern Ireland for distribution to European customers.